Bride2b.ie carries an array of designer wedding dresses in all different styles, sizes and fabrics. At Bride2b.ie sizes range from a size six to size 28. Dresses come in a wide selection of fabrics, from lace, taffetta, satin and chiffon, a choice of more than 65 colours from ivory, gold, white and rum and in styles from zipper to tie back. Bride2b.ie stock an array of different designer labels from across the globe. Bride2b.ie also cater for bridesmaids and flower girls dresses. At Bride2b.ie the staff also do their own alterations and pressing in house and the business does not charge for storage on wedding dresses. The staff look after all their brides from the moment they purchase their wedding dress, right through to the day of collection. Bride2b.ie currently stock more than 300 wedding dresses and insists on appointment basis only. 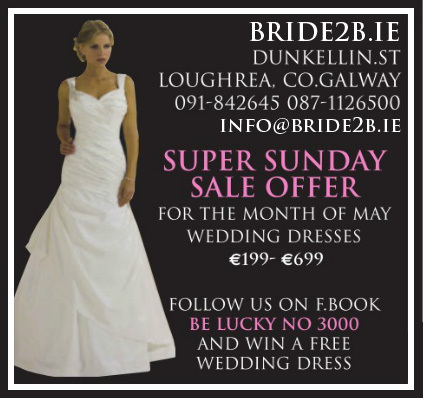 Bride2b.ie is located on Dunkellin Street, Loughrea, County Galway. The shop is open Tuesday to Saturday from 10am to 5.30pm. 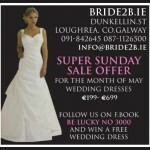 Bride2b.ie’s Super Sunday special offer sale runs every Sunday this month from 10am to 6pm. For more information contact the shop on (091) 8452645 or 087 1126500, email info@bride2b.ie, visit www.bride2b.ie or follow and like the Bride2b.ie Facebook page.